"The case study method had such an enormous impact on me that I have made it a key part of Procter & Gamble's leadership training programs. There's nothing like having to step into a decision maker's shoes to learn about leadership." "If you can find work that both stretches you and plays to your strengths, you'll have a remarkable career. Read the works of military historians—not just modern business gurus—if you're interested in mastering the power of strategy and the power of execution in your job." A.G. Lafley has been credited with turning around Procter & Gamble since taking over the consumer-goods giant four years ago. P&G recently reported the strongest earnings in its long history, and its stock price has doubled since 2000. Key ingredients in the company's resurgence include innovation, micromarketing, and an emphasis on nurturing talent. 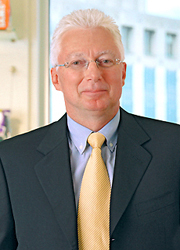 Notes Lafley, "Our assets at P&G are our people and our brands." A.G. Lafley is proud of the fiscal year that Procter & Gamble recently completed. It's his fourth year on the job as CEO, and P&G's sales topped $50 billion—the best results in the history of the company, which was founded in 1837. "I'm thrilled because the year reflects the great work of P&Gers around the world," he says. "It shows that our strategies are working, that we're leveraging our core strengths, and that our leadership is focused." According to Lafley, this triangle of success at P&G—strategy, core capability, and leadership—is at the heart of the company's ability to "deliver consistently strong results." Lafley has been credited with turning P&G around since taking the helm of the consumer-products giant in 2000. In addition to superlative earnings, P&G has seen its stock price double. The ingredients for Lafley's success include a laser-like focus on innovation and on building the company's bevy of billion-dollar brands like Crest, Pampers, and Tide. He has also given considerable emphasis to nurturing talent, instituting leadership programs aimed at everyone from P&G's top 100 managers worldwide to the company's new hires. Lafley notes, in what could be a company mantra, that "our assets at P&G are our people and our brands." When Lafley was named CEO, the company was in a slump because of low earnings and low morale. It had lost focus on the basics. Lafley's inspirational leadership style, which emphasizes listening, coaching, and results, and his attention to fundamentals—treating the consumer as boss and focusing on P&G's big brands, top markets, and key customers—are being hailed for their "revolutionary" impact. As one analyst told Fortune magazine last spring: "In the eighteen years that I've followed Procter, I have never seen the company this good." Crest and Pampers, for example, have regained market share after losing their number one positions in the United States several years ago to Colgate-Palmolive and Kimberly-Clark, respectively. Crest won back the top spot recently by introducing teeth-whitening products and by acquiring the battery-powered SpinBrush, now the nation's best-selling toothbrush. Retailing for around five dollars, SpinBrush accounted for $160 million in sales last year and is the subject of an HBS case study. "SpinBrush is a wonderful example of the kind of innovation I've been pushing hard," says Lafley. "While P&G is very good at developing, qualifying, and commercializing innovation, we're not necessarily any better than others at creating it. So when we learned about a toothbrush that an entrepreneur had made from a spinning toy he had developed, we realized that this was a simple, elegant, low-cost, and high-value innovation that was conceptually and strategically right for us." An initiative launched by Lafley calls upon P&G to find half of its new products outside its walls, up from 20 percent four years ago and about 35 percent today. Lafley has also pushed for aggressive target marketing of P&G's mature brands such as Tide, which was developed in 1946 as the country's first synthetic laundry detergent. Today, Tide is available in dozens of differentiated product offerings around the world, including Tide with Bleach, Clean Rinse Liquid, and now Tide with a touch of Downy. Lafley, who oversaw the breakthrough development of Liquid Tide in 1984, is proud that most of P&G's growth in recent years has come from core products that are household names around the globe. "I really believe you should play to your strengths," he says. "Our business model is very simple. It commits us, first and foremost, to improving the everyday lives of consumers." Despite P&G's successes, Lafley is well aware of the dangers that can loom on any operation's horizon. He has talked publicly, for instance, about the limitations faced even by a company that has more than 100,000 employees in 80 countries and that sells its products in 160 nations. "The biggest thing I worry about is that we'll make an acquisition or expand into a new market that stretches our capabilities beyond what we can really handle," he observes. So far, Lafley's instincts have been right on the money. His decisions to purchase Clairol in 2001 for $5 billion and Germany's Wella in 2003 for $7 billion—P&G's largest acquisitions ever—are already paying off by making the company's beauty-care division one of the most profitable beauty-care operations in the world. A history major at Hamilton College, Lafley initially planned on a career as a professor. He started a Ph.D. program in medieval and Renaissance history at the University of Virginia before leaving to enlist in the U.S. Navy. After several years of running grocery and specialty stores at a U.S. base near Tokyo, Lafley became "hooked" on merchandising and enrolled at Harvard Business School. MBA in hand, he arrived at P&G at the age of 30 as an assistant brand manager for Joy dishwashing detergent. A variety of other assignments followed, such as helping turn around P&G's beauty products business in Japan and building the company from the ground up in China. After 27 years, he still can't imagine a better place to work. "I feel honored and lucky to be part of such an extraordinary organization."